Fayette, MO – CMMG has announced the release of the MkW ANVIL, an all-new mid-sized AR rifle platform, chambered in .458 SOCOM. The MkW ANVIL is uniquely engineered to easily handle calibers with large casing diameters such as .458 SOCOM. The most defining feature of the new MkW ANVIL is that the rifle utilizes CMMG’s unique POWERBOLT design, which allows the rifle to utilize a modified AR10-sized bolt for increased durability. This is important because a large-diameter caliber such as .458 SOCOM would require material to be milled out of a standard AR15-sized bolt in order to function – resulting in a thin, fragile bolt face. The POWERBOLT design allows the MkW ANVIL to take this caliber to its full potential. The rifle is also built on an AR10-sized frame with the upper receiver shortened by three quarters of an inch to minimize weight and increase ergonomics. Although the frame is based on the AR10 platform, the magwell on the lower receiver has been uniquely designed to accept standard AR15 magazines. This allows the rifle to utilize the durable AR10-sized bolt face with the large case diameter of big bore calibers such as .458 SOCOM, in which approximately 10 cartridges fit single stack in an AR15 magazine. 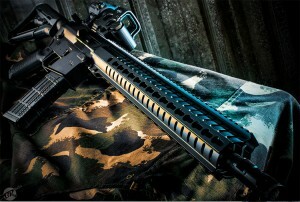 The MkW ANVIL is built with a carbine-length gas system and utilizes an SLR Rifleworks Sentry 7 adjustable gas block. This allows users to easily adjust the gas metering in click-adjustments to work with varying loads of .458 SOCOM ammunition. Each rifle comes standard with one modified Lancer L5 magazine that has been optimized for reliability with the cartridge. Additional magazines can be purchased from the CMMG website. A full-length Picatinny rail runs atop the MkW ANVIL, making it easy to mount your preferred sights or optics. CMMG’s RKM15 KeyMod™ hand guard is exceptionally light and ergonomic. It also gives users the freedom to mount a wide array of accessories using the KeyMod slots found in the 3, 6 and 9 o’clock positions. For accessories that are not yet KeyMod compatible, CMMG offers 5-slot accessory rails. As legend has it, the concept for .458 SOCOM was invented over burgers and beer by members of the Special Forces community. The discussion arose from recollections of Task Force Ranger’s experiences in which it took multiple shots – using 5.56 NATO – to bring down members of the opposing forces. Out of this, the inspiration for a caliber capable of delivering more energy at close distances was born. — The cartridge had to fit in an M4 Carbine Platform with a proper barrel. — The cartridge had to fit in standard 5.56mm magazines. — It needed to be capable of firing at subsonic levels using suppressors. As a result, Marty ter Weeme of Teppo Jutsu invented the .458 SOCOM cartridge in 2000. Tony Rumore of Tromix built and fired the very first .458 SOCOM rifle in February of 2001. Upon testing, it was found that the .458 SOCOM not only lived up to the initial functionality requirements set forth, but also demonstrated the intended ballistics to make it a viable caliber for big game hunting. With lighter bullets in the 140-400 grain range, the .458 SOCOM achieves velocities of 1600-3000 feet per second, which have proven to be extremely accurate out to 150-200 yards. When using heavier bullets between 500-600 grains, velocities will be approximately 980-1300 feet per second, which are ideal for suppressors. While many wildcat calibers have been adapted to the popular AR15 platform over the years, concerns with longevity, durability and reliability have always plagued the AR15 platform. Many wildcat rounds require a significant removal of bolt material to accommodate the larger base of wildcat rounds. Removing material weakens the bolt and increases the chance of catastrophic failure when used with high performance wildcat rounds. While function is possible, the AR15 platform doesn’t provide much in terms of margin of error. Thankfully, CMMG’s MkW ANVIL solves the issue by offering the durability of an AR10-sized bolt face to stand up to this potent caliber, throughout the wide range of bullet weights and muzzle velocities currently available on the market today. The CMMG MkW ANVIL was developed to be the new standard for rounds with case diameters exceeding the dimensions of the 5.56x45mm cartridge.